These watertight aluminum screw-top canisters are gasketed, lined in nylon and come with a 1" slip ring to attach to whatever. 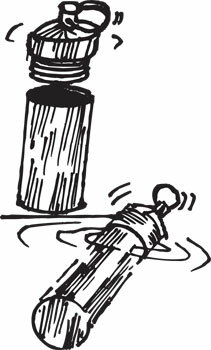 Measure just over 2-1/2" tall x 1-1/8" dia, so they're suitable for a lot of pills or any number other things you need to keep dry or safe. We'll pick one in black, red, gold, blue or green. 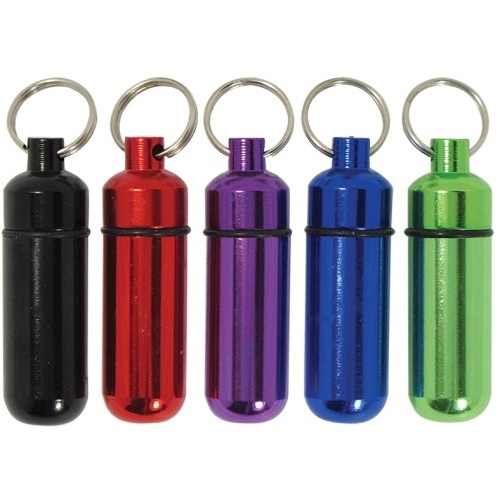 Add a little pizazz to your nitro pills! 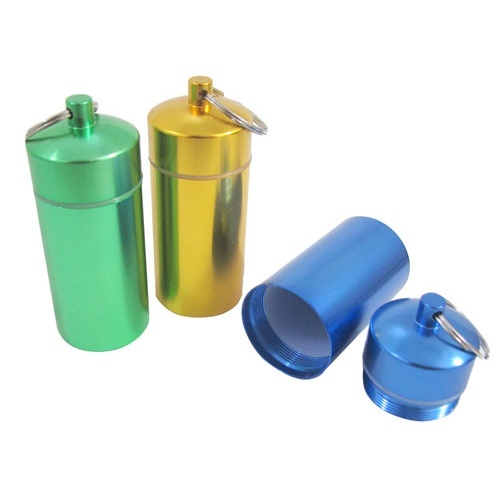 This 1-3/4" x 1/2" dia container for meds is anodized aluminum in mostly silver but also could be in blue, turquoise, purple, red, gold (our choice). It's gasketed so it's watertight. We recommend cleaning the inside with a cotton swab dipped in alcohol before using, since some have a bit of rust-colored residue in them. Flashy! 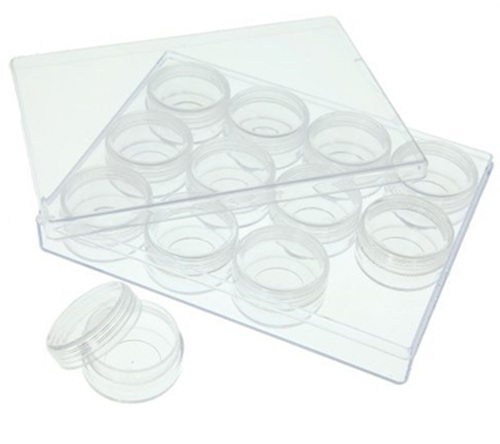 You can store a plethora and a half of things in this staggeringly cute set of a dozen screw-top clear plastic canisters, 1-1/4" dia x 3/4" deep, that fit perfectly inside this 6-3/8" x 4-3/8" x 1" deep clear plastic lidded box. How they got those circles in a rectangle is a Euclidean mystery. The manufacturer says these magnetic canisters are “ideal for storing desk accessories,” although anything larger than paper clips or pushpins will be tough. On the other hand, they’re just the ticket for storing glitter, confetti and other tiny craft supplies. 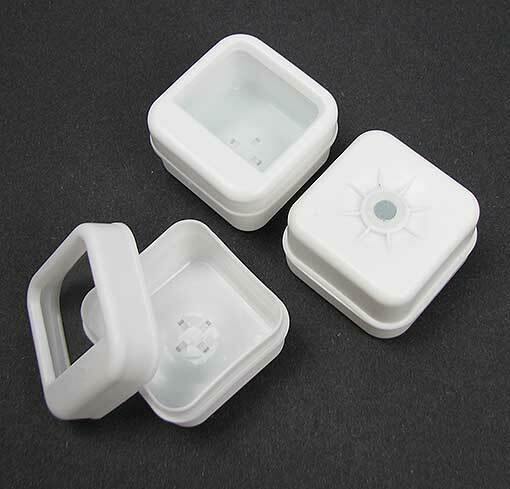 Our each is a 3-pack of 1-7/8” sq x 1-3/8” deep white plastic boxes with little disc magnets in the bottom. Tops have windows so you can see what you put in them. 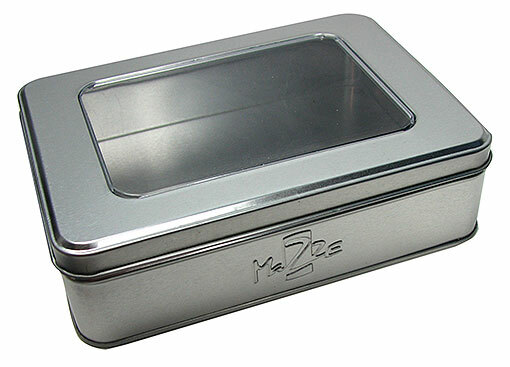 These 3-3/4” dia x 2-5/8” tall steel tins have clear acrylic windows in their lids so you can see what’s inside. Discreetly stamped “Mezze” on the side, which means hors d’oeuvres, pretty much, in a bunch of Mediterranean-ish languages. But we prefer keeping baubles, buttons or bows in them, though. 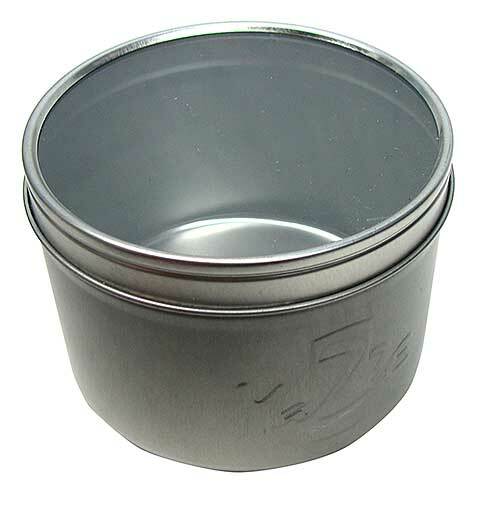 These nice, bare steel tins measure 6-5/8" x 4-3/4" x 1-7/8", and have a 4-3/4” x 3-1/4” clear acrylic window in their flip-top lids. They have a discreetly embossed “Mezze” on the front, which means “appetizer” in a bunch of languages, but you can keep whatever your heart desires in them because nobody can tell you what to do. 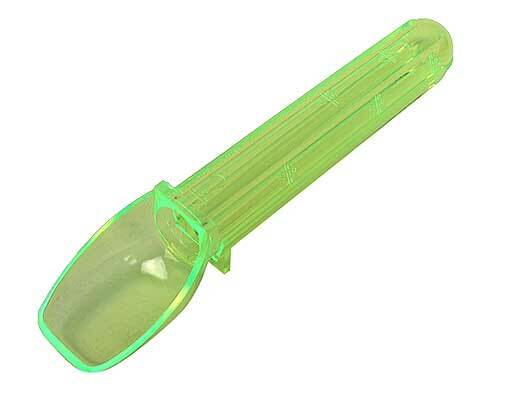 This spoon-tube, originally intended to accurately measure liquid medicine and keep it off the chins of medicine-takers, will hold up to (2) tsps or 10cc/ml. In see-through fluorescent green with a little foot at the front so you can put it down on a surface without losing the contents. Measures 4-7/8” long x 1/2” ID with a 1-1/4” spoon-like tip, and marked in tsps and ml/cc gradations on the side. 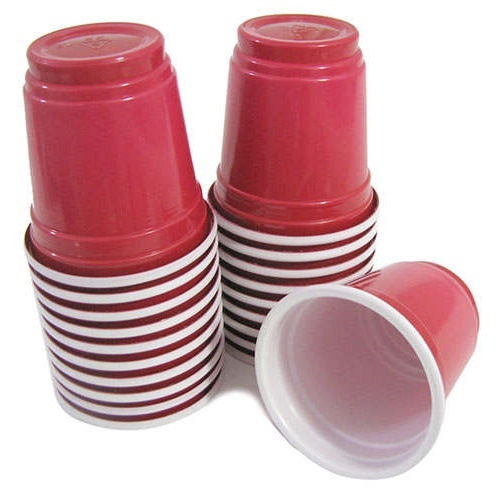 Just like the big red plastic party cups everybody has but in a 2-oz size, for when you graduate from beer to cocktails, perhaps, but they also make great condiment holders, paint pots, bead buckets for craft classes and hats for lab rats. Also useful for the really, really expert version of beer pong. Come in bags of (20). Your package of (3) gets you (60) cups. It's a critter container cornucopia. 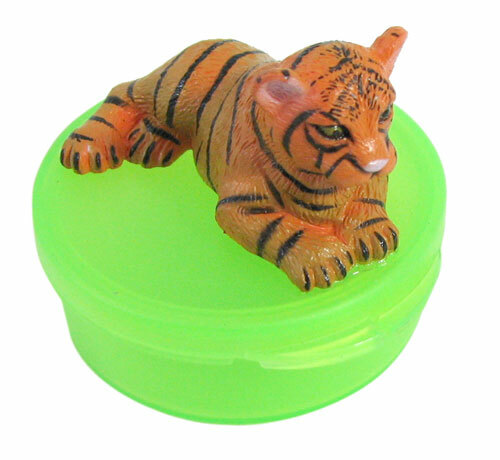 All are approx 2" dia x 3/4" deep, green plastic, with snap-shut lids, and each has an realistically colored plastic animal on top. You pick the ones with a reclining, dining panda; a white tiger couchant; or a standard tiger couchant (which means it's lying on its stomach, front legs forward, with its head up). You learn something every day, don't you? For elfin coffee pots? 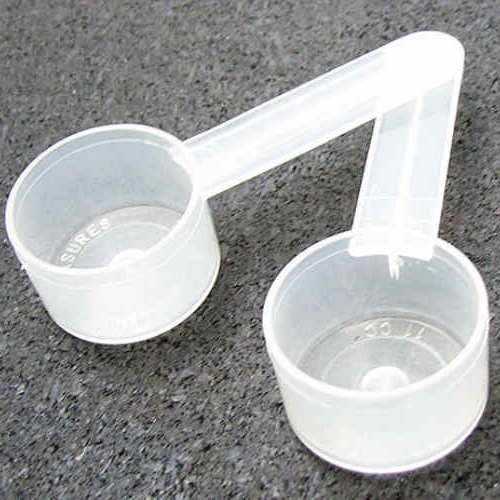 We know not, but this tiny plastic scoop measures just 3/4” x 1-3/16” dia with a 1-7/8” handle. Holds 11cc (0.37 oz). Mighty cute, and you’ll get a bunch of ’em. 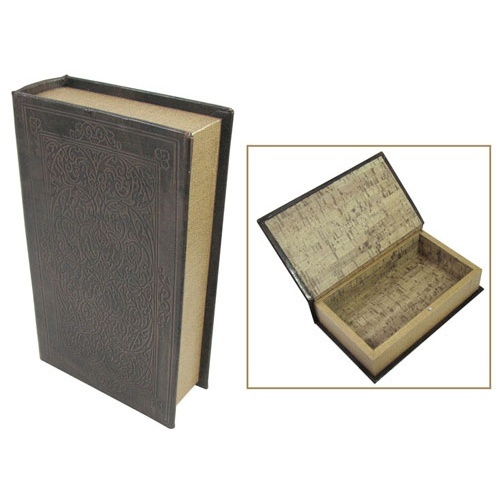 Great for classroom projects, workshops and craft rooms. Gotta keep your scoops straight.